Andy Cracknell teaches Anna Burtnet at the Leo J. Martin Ski Track in Weston. Cross-country skiing is generally considered one of the best fitness regimens known to man. That makes sense. It’s a low-impact, high-cardio, full-body workout, as intense as you want to make it. 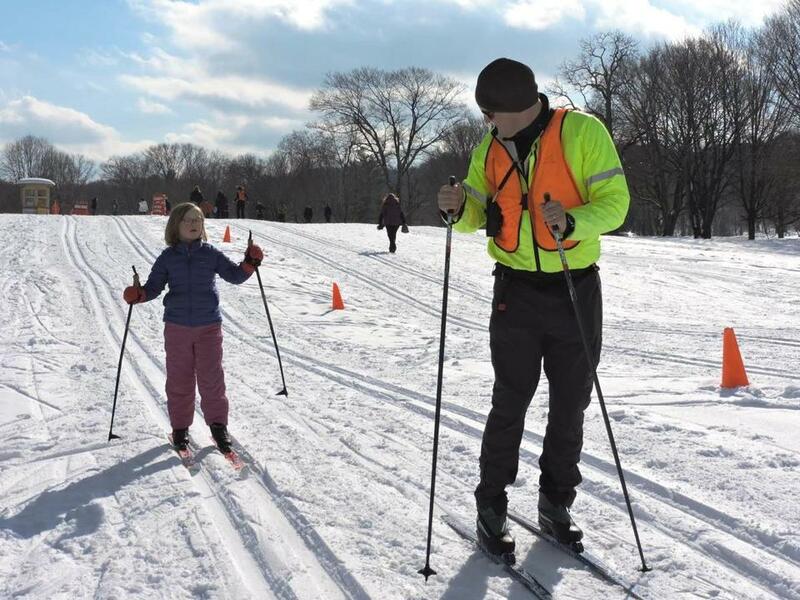 Prominent Nordic ski tracks close to Boston include the Leo J. Martin Ski Track in Weston, the North Shore Nordic Association (NSNA) trails primarily found in Hamilton and Ipswich, and the Blue Hills Reservation cross-country trail network in Milton. Of those, the Leo Martin Ski Track , maintained by the state’s Department of Conservation and Recreation, and the NSNA trails are groomed, allowing for both skating and classic kick-and-glide techniques. The DCR has invested $3 million there, including a $900,000 lighting and electrical upgrade project for night skiing and a more efficient and expanded snow-making operation. 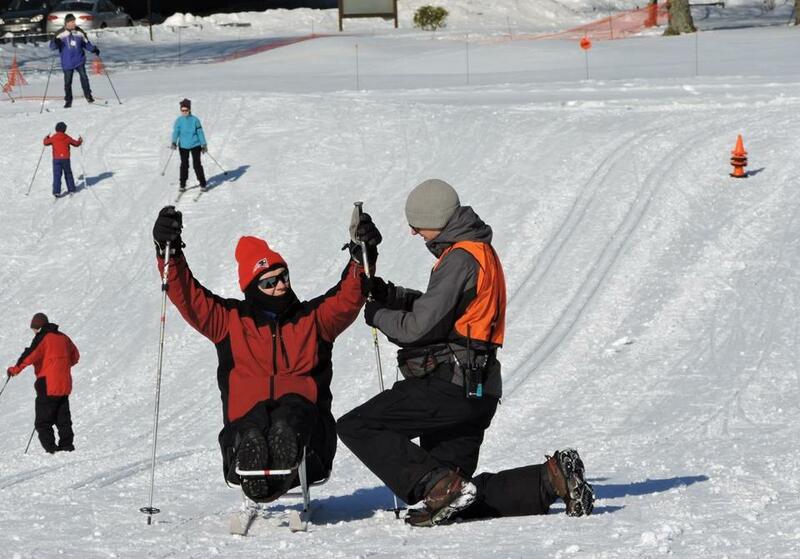 It hosts the Bill Koch Youth Ski League and DCR’s Universal Access Program for disabled skiers. The privately funded NSNA in Essex County is an example of local activism teaming with corporate donors, highlighted by the delivery of grooming equipment last winter. Trudeau, the Beverly enthusiast, joined Hamilton residents Carol and Thomas Catalano to take the nonprofit NSNA from concept to reality. “NSNA wants to start small, with basic grooming at Appleton Farms, across Pingree to Bradley Palmer and a separate Patton Park location,” said Trudeau, 54, who has been Nordic skiing since 1976, the year American Bill Koch won silver at the Innsbruck Olympics. South of Boston, Nordic fans shouldn’t confuse the Nordic opportunities at Blue Hills Reservation with the downhill ski area, which is run by a private contractor. A brochure entitled Ranger Tim’s Cross-Country Ski Routes details 10 different loops through the 100-mile network. In addition to the three highlighted Nordic centers, local cross-country skiers can forge their own path on the trails at the following DCR properties. Like Blue Hills, they’re not groomed for Nordic skiing, so conditions can vary. Middlesex Fells Reservation’s 2,575 acres offers an extensive trail network, including the Skyline Trail and Reservoir Trail in the western Fells that circles the Winchester reservoirs, and the Rock Circuit and Crystal Springs trails in the eastern Fells. The Lowell-Dracut-Tyngsborough State Forest contains 1,140 acres of protected land, including 180 acres of ponds, swamps, and wetlands, as well as 6 miles of multiuse trails. Bradley Palmer State Park is a 721-acre former estate that features acres of rolling meadows and accessible trails along the Ipswich River, straddling the towns of Topsfield and Hamilton. The Great Brook Farm Ski Touring Center offers groomed trails for cross-country skiing at the DCR’s bucolic Great Brook Farm in Carlisle. Rentals are available. At Blackstone River and Canal Heritage State Park, cross-country skiers will find 2 miles of trails along the Blackstone Canal towpath, and a 1-mile route along the Blackstone River and Canal. The Blackstone River Greenway offers another 7 miles. Leominster State Forest offers approximately 20 miles of trails, many of which feature a quiet, peaceful escape in the midst of this urban tract. At Myles Standish State Forest in Carver and Plymouth, cross-country skiers can glide over 15 miles of multiuse paths, including the largest contiguous pitch pine/scrub oak stand north of Long Island. Wompatuck State Park in Hingham offers cross-country skiers 12 miles of multiuse trails and many miles of wooded bridle paths and hiking trails. Sitskier Thomas Dodd is guided by Will Morgan at the Leo J. Martin Ski Track in Weston. If you have an idea for the Globe’s “On the Move” column, contact correspondent Brion O’Connor at brionoc@verizon.net. Please allow several weeks advance notice.